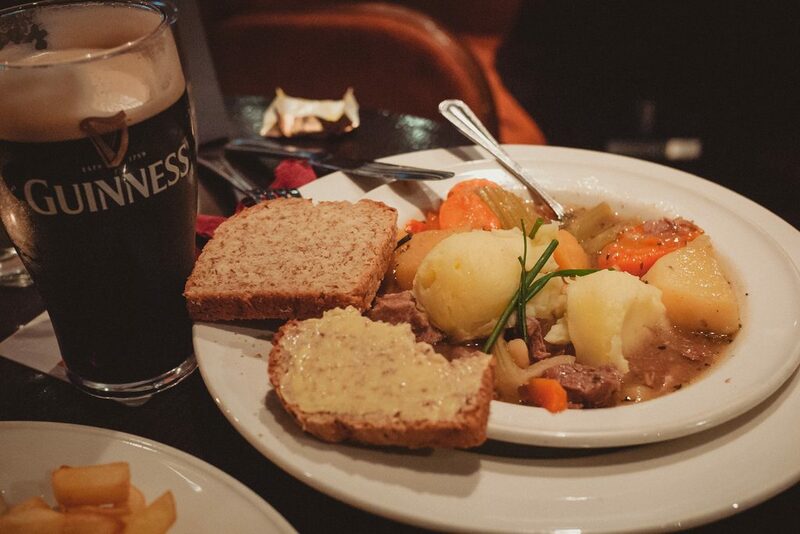 Nothing goes down better with a pint of Guinness than a classic Irish Stew. So here is your recipe for St Patrick’s Day! · Place a large, casserole pot over a high heat, add 1 tablespoon of the oil and brown the lamb pieces in two batches. · Remove and set aside on a plate. · Reduce the heat to medium–high, add another tablespoon of oil and fry the onion, celery and carrot for 4–6 minutes or until the onions have softened. · Preheat the oven to 160°C /325°F/Gas Mark 3. · Return the meat to the pot, along with the stock, season with salt and black pepper and bring to the boil. · Remove from the heat and push the slices of potato down into and across the top of the stew, dot with a little butter and give a final seasoning of salt and black pepper. · Cover and place in the oven to cook for about 1½ hours or until the meat is tender, then remove the lid and cook for a further 10 minutes until the potatoes have coloured. · You can serve the stew straight away or leave it covered overnight in the fridge for the flavours to develop. · Serve in deep bowls with slices of white bread to soak up the liquid.